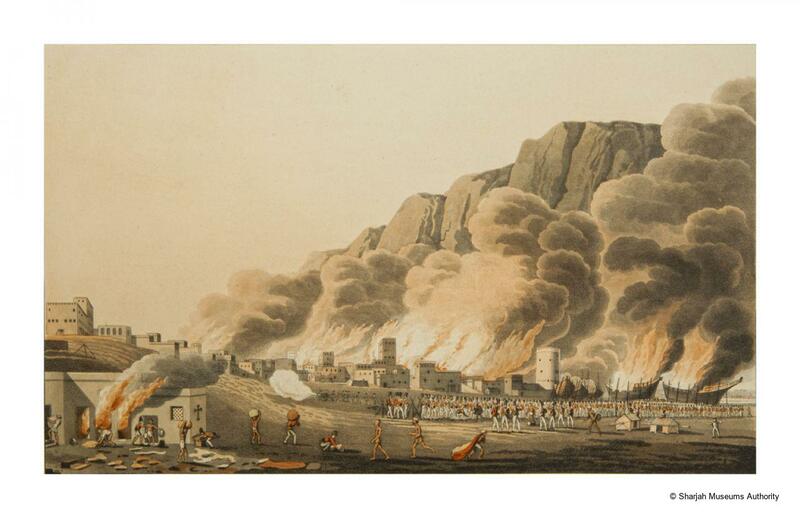 In this image, the artist - a soldier with the British forces attacking and devastating Qawasim strongholds in 1809/10, records the wholescale devastation of Ras al Khaimah on the afternoon of November 13th, 1809. Looking at the town from the southwest, he records in graphic detail the inferno British troups visited on both the town and the Qawasim's majestic dhows. Both are seen being consumed by a firewall of flames, the smoke billowing densely above. A large contingent of inactive British troops is seen standing along the perimeters of the town, unconcerned by the devastation behind them. In the foreground on the left, a group of workers is instructed by British officers to remove things from a burning builiding, which - interestingly - is marked with a large cross on its side wall. Eye witnesses to this event record that the town was cannonaded since the day before, while troops stormed strategic positions. By 4 pm on the 13th, all the Qawasim's vessels were burning, together with their naval stores and houses, most of which were looted by the British forces.